Problem: You are opening STEP files in Inventor and converting them to sheet metal parts, but then the ‘Thickness’ property doesn’t show up on your drawing (or drawing parts list) What to do? Allow me to explain - For bringing in a Parasolid/IGES/other CAD file import into Inventor and converting to sheet metal there is no problem. You can simply create a new sheet metal part file and import the model into it. This means that all your sheet metal parameters are already present and correct in the part. But currently in Inventor (2014) you can’t import a STEP file (see pics below, it’s not supported), you have to open the STEP directly, and hence you don’t get a choice which template to import it into. The simplest option available to us, is to open the standard.ipt template, add a user parameter called ‘Thickness’ (capital ‘T’ remember), and tick the ‘export’ box. Then save the template. ….the Thickness parameter that you placed in the template will be populated by the sheet metal thickness that is currently applied, AND it will still have ‘export’ ticked (even though it is now a ‘User’ parameter not a Model parameter). Now you can bring this into your drawing, and the thickness field will automatically be filled, just like normal. Last question: what about decimal place formatting? Simple enough – open up your standard.ipt template, right click on the ‘Thickness’ parameter and hit ‘Custom Property Format’. In here you can set a whole load of options for decimal places, whether you want a unit string (e.g. ‘mm’ to show, etc. Note, even though it is a number, you can leave it as a text parameter. If you don’t want to go tinkering with adding parameters to your standard.ipt part file, then you can always use iLogic for this. 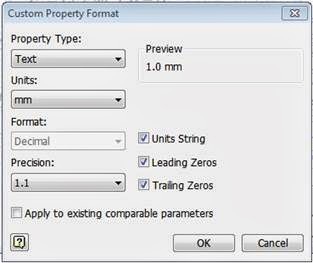 The following iLogic will export any existing Thickness parameter to an iProperty, with the decimal place formatting you want (comment out the lines of code to suit). 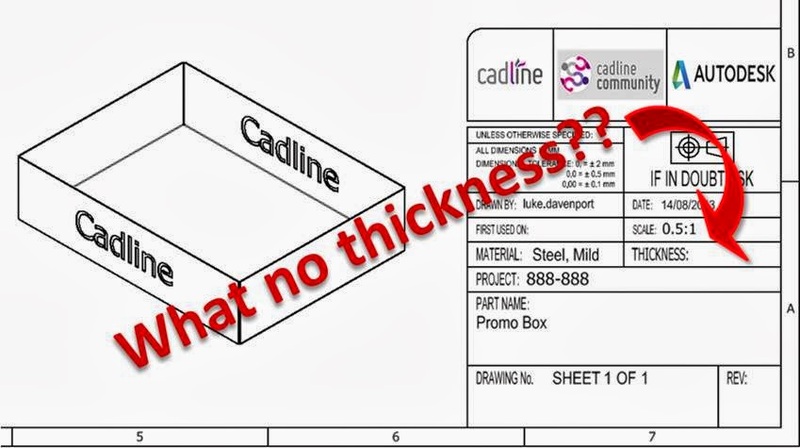 The Thickness parameter that is created when you convert the part to Sheet Metal will be copied across automatically. Make sure you set the event trigger for the rule to run ‘Before Save Document’. 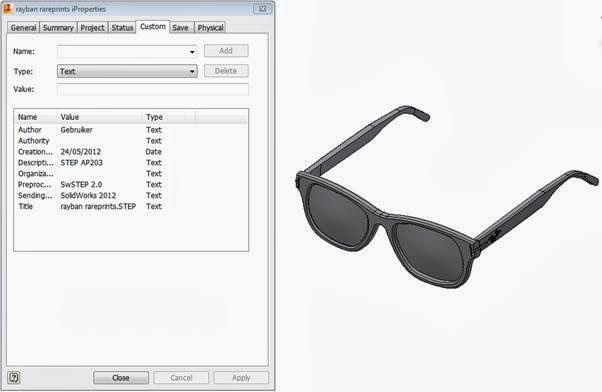 One last tip: on STEP imports before I go – should you ever need to know which CAD software the file originated from (and when and by whom…), you can find this information in the custom iproperties of the Inventor file. As you can see, the nice pair of Raybans below originated in a certain other competitive CAD software whose name I will not utter here. How childish. Enjoy!